Nidhogg's sword-fighting is exhilarating and exquisitely balanced. Against friends, its appeal is perhaps limitless. Besides, there are worse things in life than being encouraged to get your money's worth from Nidhogg; to put the TV somewhere everyone can see it, to get some pads linked up and throw a local multiplayer party. Rounds of Starwhal: Just the Tip and Samurai Gunn, leading up to a Nidhogg tournament? That evening would be priceless. A superb multiplayer game with some of the best virtual sword-fighting ever seen, giving you the best reason to crowd round a PC since a kitten did something cute on YouTube. Nidhogg isn't too satisfying alone, but it offers frantically enjoyable sword-dueling action with local friends. Under the right circumstances, Messhof has established a new and shocking blood sport that'll captivate audiences and players alike. At home, by yourself and frustrated by searching for a multiplayer opponent, you might tear your own heart out. Regardless of all that, Nidhogg stands as one of the true kings of competitive gameplay, and that doesn't need to be patched one bit. To put it plainly, Nidhogg is incredibly fun. If you can appreciate the game's style for what it is and you don't have an ego as fragile as glass, you'll delight in testing your mettle against another's. And even if you lose, at least you didn't get eaten by some horrible beast. Nidhogg is a fun and simple fencing game that's sure to get your competitive juices flowing, despite an unstable netcode leading to a slew of online issues. As the years go by, opportunities to shout expletives into the face of someone you call your "friend" become less and less frequent. Nidhogg brings that joy back into your life. One of the best local multiplayer games I've played in years. As a singleplayer game, rushing towards completing its series of AI fights at faster and faster speeds is a pleasing diversion, sustained by the AI which seems as silly and quirky as any person. As a multiplayer game, it's destined to be brought out late at night, whenever you've got friends around. Don't worry, you'll say. Nidhogg is easy to explain. 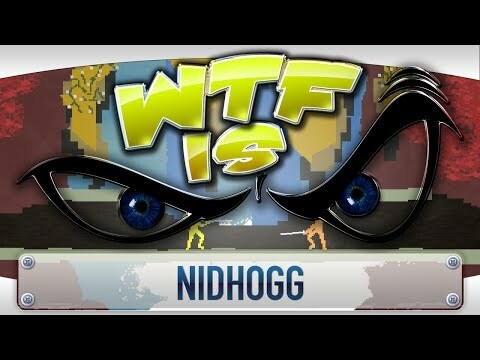 A wonderful mixture of slapstick and precise competitive duelling, Nidhogg is thoroughly entertaining. Nidhogg is a strange, unholy pastiche of lo-fi aesthetics and surprisingly deep, albeit minimal play; taking cues from decades of arcade-style 1v1 fighting games and modern indie darlings. Nidhogg is definitely a blast if you have a few friends around, and it's easy to see why it has been hyped up over the last few years. It does what it sets out to do, providing plenty of thrills and laughs in the process. But if you don't have any buddies nearby who would be into swordfights, it's worth holding off until the online becomes more stable. Nidhogg is yet more proof that a simple concept with a simple goal can work, and work well. In a way, it reminds me of a Super Smash Brothers Melee tournament; simple combat and pure competition, that's what makes Nidhogg so amazing.